Teesside half marathon man Matty Hynes is hoping to go the distance in his new role with a Stockton-based software development company. Matty has joined fast-growing Sapere, which recently moved into new offices to accommodate its expanding team following a recruitment drive, as its new business development manager. The runner has an impressive athletic CV including representing Great Britain in European and World Championships and being ranked number two behind Mo Farah. He’s tasked with continuing Sapere’s strong growth and building the company’s presence in the North East and beyond. 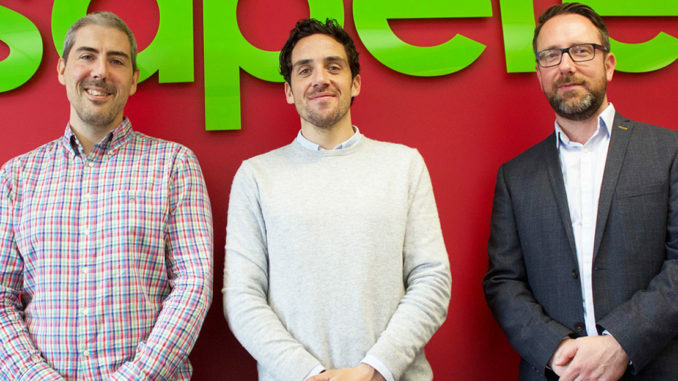 “I knew of Sapere, having heard great things about the business,” said Matty, pictured above (centre) with the firm’s managing director Paul Drake (right) and Shaun Merifield. Meanwhile, Sapere has been working on a project with Troocost to help businesses get the best deal on their utilities. The system provides an energy benchmarking service to allow users to obtain the best deal without having to physically shop around, saving both time and money. Paul Drake, operations director at Sapere, said: “We were excited by the uniqueness of the solution that Andrew presented to us. It sounded like something no one would want to be without, and we wanted to be involved with the journey. The project began in 2016 and it took around six months to fulfil the brief, but Sapere’s work has continued as the Troocost site grows with and adapts to the ever-changing industry.